At Pax West 2017, Razer showcased all of the products they announced within the last week and change. The new Razer Basilisk mouse uses customizable and interchangeable components, allowing you to adapt it to your preferred FPS experience. The Razer Blade Pro is now offered with a new configuration allowing for a cheaper price point than the original model. Also, the Razer Wolverine Ultimate controller brings even more customizable options for use on the Xbox One and Windows. All of these products and more were available for hands-on and peeks at Razer’s booth at Pax West 2017. Let’s dive into each! The Razer Basilisk is Razer’s latest 8-button mouse model coming with customizable components and the same 5G true 16,000 DPI sensor seen in the Razer DeathAdder Elite we reviewed a while back. It uses Razer Mechanical Switches with a 50 million click lifespan and a scroll wheel whose resistance level could be customized per the user’s preference. The Razer Basilisk also comes with a removable clutch coming in a long and short lengths and a rubber thumb cap for those who prefer to not use the clutch component all together. With the standard Razer-headlining Razer Blade Pro housing a NVIDIA GeForce GTX 1080 graphics card, Razer opted to create a lower-priced configuration of the product. The new Razer Blade Pro option uses a full HD display and an NVIDIA GeForce GTX 1060 GPU to start off at a price point of $2299.99. 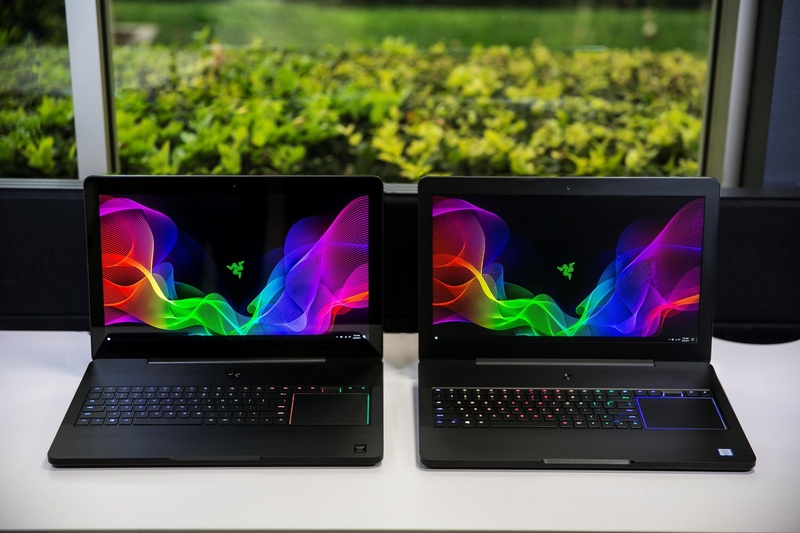 This option will continue to sport present-day Razer Blade Pro features such as a CNC military-grade aluminum body and a keyboard with anti-ghosting individually backlit keys featuring 16.8 color choices. The new Razer Blade Pro endeavors to reach more gamers and professionals with its new price point for a highly portable 17.3-inch desktop replacement. The 0.88 inch thin and 6.78-pound Razer Blade Pro will be available on Razerzone.com in Q3 2017 and will hit worldwide markets by the end of the year. Razed even announced the new Razer Rogue 17.3” Backpack for toting around the Razer Blade Pro or other 17.3 inch laptops. We got our hands on one so we’ll let you know what we think once we put it through its paces. It is available now on Razerzone.com for $149.99, and will hit worldwide markets by the end of the year. Click here to read about the Razer Wolverine Ultimate controller for Xbox One and PC, announced earlier last week.